Best Online Video Converter alternative to convert videos to MP4. Support 1,000+ video/audio files to convert. Built-in video editor to crop/trim/rotate videos before converting. Video conversion tools are high in demand owing to the availability of wide range of formats. Due to technical specifications, compatibility of video formats differ from device to device. So if your format could not play on your device, you would need to convert it to a supported format. Instead of changing your format for every single device, opting for a universal format makes a sense and what can be a better choice than MP4. 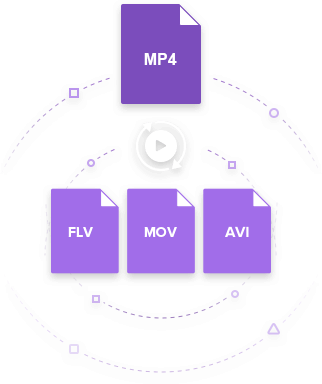 Due to its compressed nature and good quality, MP4 is one of the most commonly used video format that can be played on almost all types of devices. Below part of the article will discuss online video converter to MP4 and its upgraded alternatives to convert video files to MP4. Majority of the online programs prevent you from hassles of download and installation process as they work online through your browser. Thus these tools are simple to use and do not occupy unnecessary storage on your computer. Pocket-friendly is another benefit of using online video converters. Most of the online programs are available for free of cost and have decent feature list. 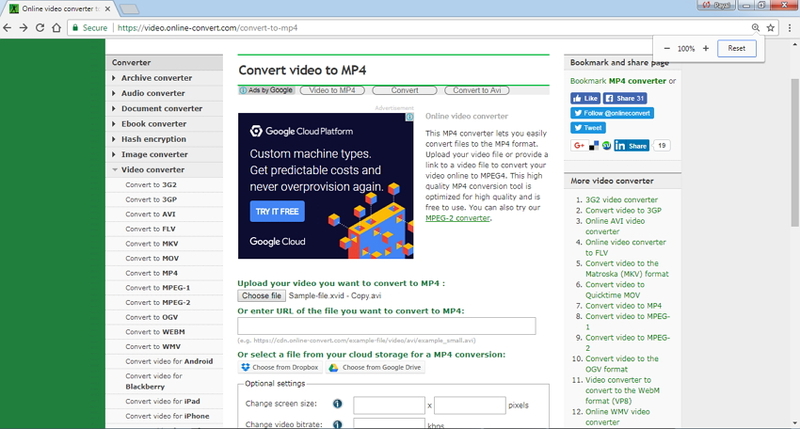 Thus you can use your free online video converter to MP4 when you want basic conversion functions. Online tools are designed keeping the needs of non-technical users in mind. Thus even if you are not too pro with the technology, you can easily use these tools for converting your video files. Moreover, since these tools need no installation, there is no restriction to be used from any specific PC. Thus you can use online converters anywhere, anytime. There are a decent number of online programs that allow to convert video files to MP4. A round-up of the top 6 free online tools are given below. 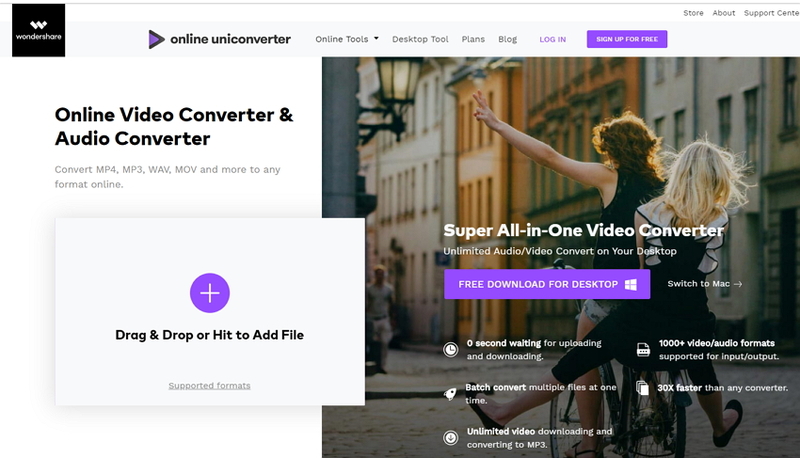 Online UniConverter (originally Media.io) is an online free video converter which support most popular video formats such as MP4/AVI/MKV/MPEG and more others. It also supports convert audio files such as MP3/WAV/M4A, etc. It has an easy-to-use interface and you can finish your conversion within minutes. It has customer support center so you can find their staff anytime if you need. • Support most popular video/audio formats to convert. • Easy-to-use interface and high-quality output. • Free version support up to 100MB file size at a time. This is one of the popularly used online tools that allows converting an array of video formats like MKV, AVI, MOV, FLV, and others to MP4. Thus Online Convert also works as a decent MKV to MP4 online program. The program allows adding files from PC, Dropbox, Google Drive or its URL for conversion. The program also allows file customization by editing screen size, video bitrate, audio quality, and other parameters. • Free version support only 100MB file for conversion. • For larger size files, paid version can be selected. • Multiple plans for paid version support additional features like ad-free pages, high conversion speed, concurrent conversions, and others. 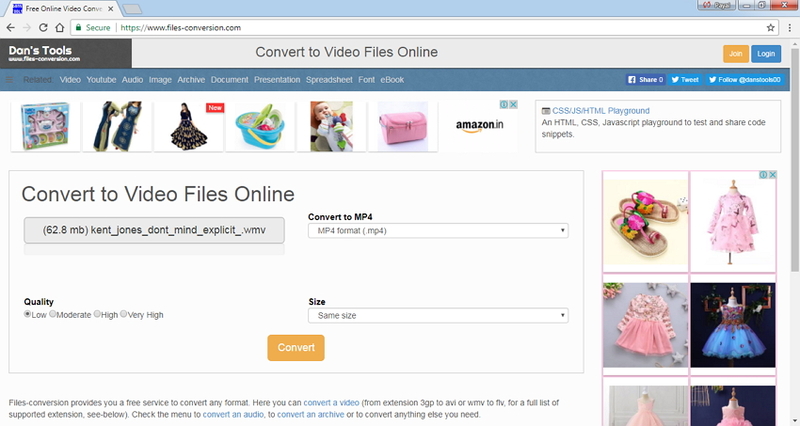 Files conversion is a simple to use free online program that allows converting videos to MP4 in quick steps. The program supports commonly used formats for conversion and needs no download or installation. For converting, you simply need to add the desired video from your PC, select output format, quality, and size. • Support common video formats like 3GP, AVI, FLV, MPG, WMV, WAV, and others. Thus it also works a good AVI to MP4 converter free. • Free version supports only 100MB files for conversion. • For larger file size, you can opt for paid version that comes with multiple plans- 24 hours, Light, Basic, and Unlimited. • The paid version support additional features like unlimited conversions minutes per day, unlimited maximum conversion time per file, ad-free pages, concurrent conversions, and others. 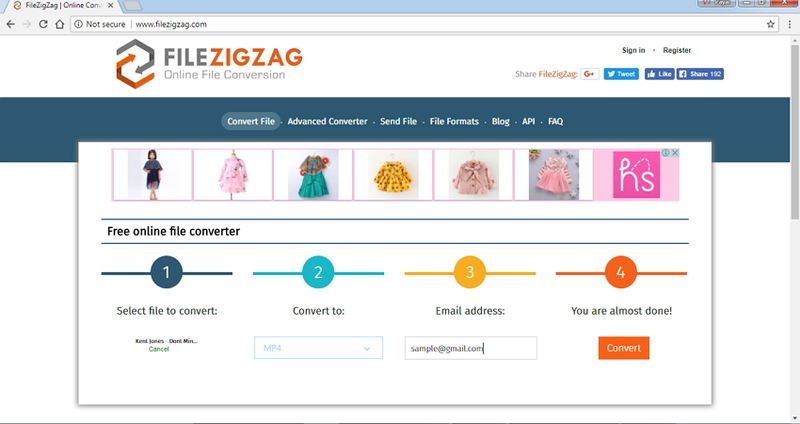 FileZigZag is a popular online tool that supports an array of file types and formats for conversion. With multiple formats support, it also works as an online MKV to MP4 converter. The program is simple to use where you need to add the video file, select output format, and enter your email address. The download link for the converted file will be sent to the desired mail id. The software needs no download or installation. • Free version of the program supports maximum of 100MB file for conversion. • Go can opt for registered paid professional plan for larger size files. • Paid plan support file upload up to 1GB, ouput file up to 2GB, and unlimited file conversion up to 1GB. This is another name in the list of top online converters. 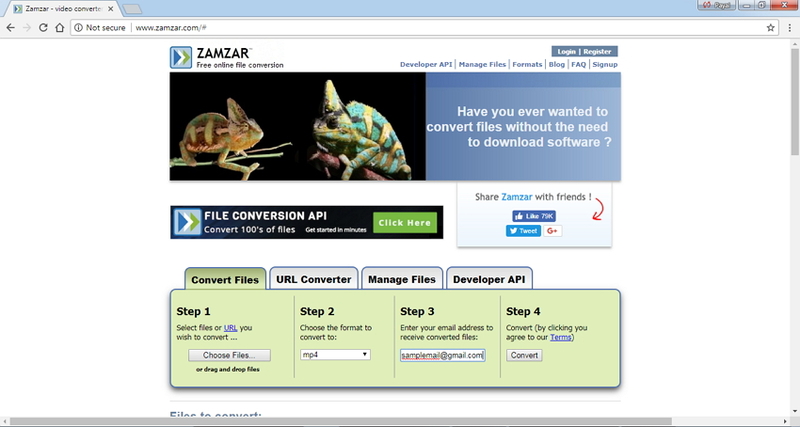 The tool supports all major image, video, audio, documents, and other file types for conversion. For converting files, you can drop and drag them to the interface or add them from your PC. Next, select the desired output format and enter your mail address where you want the download link of the converted file. Popular formats are supported by Zamzar so that you can use it as an online MKV to MP4 converter or, AVI to MP4 converter free. • Maximum of 50MB file can be uploaded to the free version for conversion. • The program comes with multiple paid plans – Basic, Pro, and Business that support maximum file size of 200MB, 400MB, and 2GB respectively. • Paid plans allow multiple concurrent conversion, online storage, conversion through emails, and other features. • The paid plan also comes with personal inbox to manage the files. As listed in the above parts of the article, there are a number of benefits of using online converters. On the flip side, these converters have basic features and not apt for professional needs. There are many drawbacks of online video converters as discussed below. Online video converters support popular video formats. The type and number of formats that can be converted using these online tools are limited as compared to professional desktop software. Since online tools work on your browser, they are totally dependent upon the availability of Internet. If your Internet is not steady or very slow, it will consume much time to convert one file. The conversion speed of the online tools is slow and also dependent upon the speed of your Internet connection. Since the majority of the online programs are free to use, the supported features are limited. Most of these tools do not support functions like batch processing, editing tools, device-specific format conversion, and others. Support more than 1,000+ video/audio formats for conversion. Best online video converter to MP4 alternative to convert files at 30X faster speed. Built-in video editing tools helps in file customization, like trimming, cropping, adding watermark, subtitles etc. Download videos from 10,000+ websites by pasting URLs. 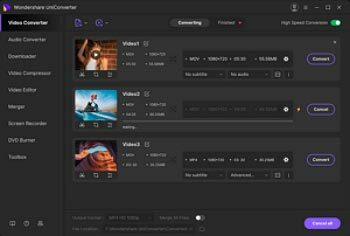 Additional toolbox with functions of Fix Video Metadata, VR Converter, GIF Maker, Screen Recorder and more. After downloading and installing the software on your PC/Mac, open it and you'll come to a new interface under Convert tab. Click +Add Files button on the left-top corner to open the browse and add the local videos you want to convert to MP4. Once the video file is added to the software interface, open drop-down menu next to Convert all files to: option. Select MP4 as the output format and the desired video resolution from the Video tab. Finally, click Convert All button to start the conversion process. The destination location where you want the converted MP4 file can be selected at the Output folder. Note: Wondershare UniConverter (originally Wondershare Video Converter Ultimate) supports file conversion between 1000 formats. 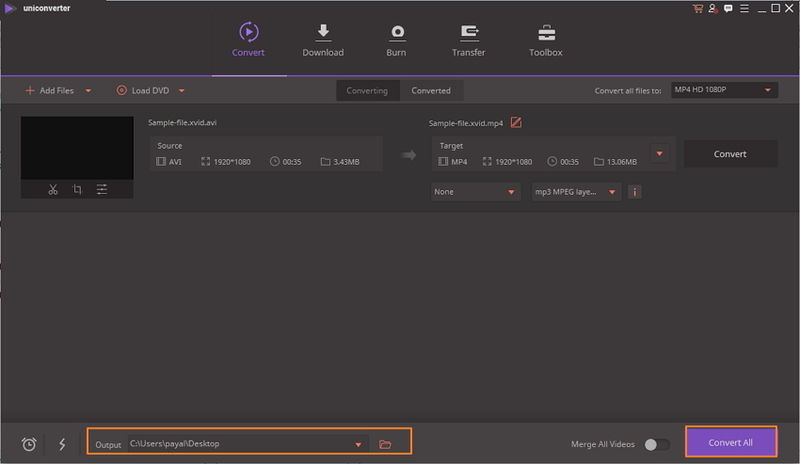 So if you are not able to convert MKV to MP4 online, or your tool does not support to convert MOV to MP4 online, Wondershare online video converter alternative is there to look after your needs. 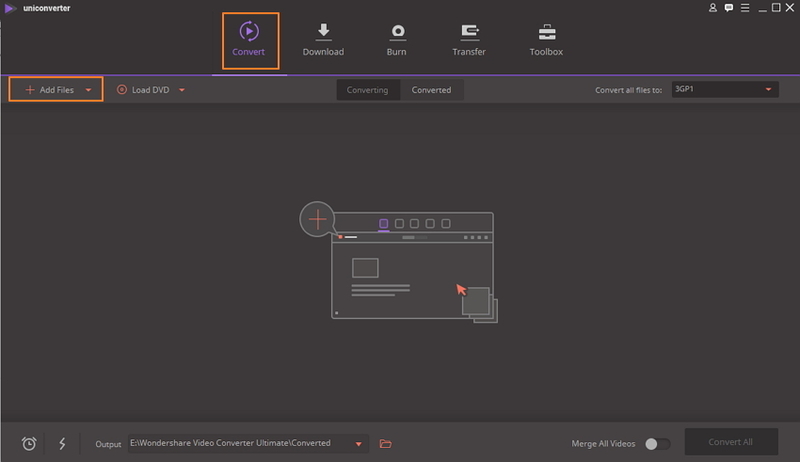 So you can either go for online video converter to MP4 for basic conversion needs or install Wondershare UniConverter (originally Wondershare Video Converter Ultimate) for super fast, lossless quality video conversions.